Whitehead Community Centre (image Google). 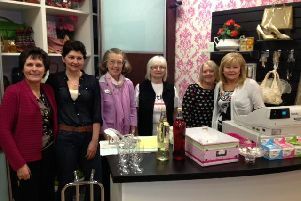 The East Antrim branch of Leukaemia and Lymphoma NI will hold its annual antiques and craft fair on Saturday, May 5. It will take place in Whitehead Community Centre, Balmoral Avenue, Whitehead, from 10.30am to 4.30pm. Books, quilted cushions, art, felting, jewellery, terrariums, crochet, decoupage, fused glass and vintage accessories will feature at the event. Further attractions for fair-goers will include jam, chutney, marmalade, vintage cake stands, china and collectibles, vintage tools, hand made cards and boxes, knitwear, bags, dolls and dreamcatchers. The admission charge is £1 (accompanied children free). Tea, coffee, scones and traybakes will be on sale all day. Last year’s highly successful fair raised approximately £2000 for research into leukaemia, lymphoma and other blood cancers. The research is carried out at the Centre for Cancer Research and Cell Biology, City Hospital, Belfast.